Click to download a PDF version of this report. Inspired by the 2009 Mondragon International and United Steelworkers collaboration, 1worker1vote incorporated as an economic development catalyst non-profit in the State of New York, mid-spring 2015, at the hands of CUNY Law School’s Community Economic Development Clinic (CEDC), an institutional co-founder specializing in hybrid ownership model and intellectual property structuring to share innovation throughout the 1worker1vote movement. 1worker1vote commits significant time and effort to co-designing, co-launching and co-sustaining profitable enterprises, missions and projects in collaboration with the Cincinnati Union Cooperative Initiative (CUCI), another institutional co-founder that serves as the prototyping “living lab” for the 1worker1vote movement. Self-funded to date, we serve our mission pursuing rising individual and community fulfillment opportunities and equal social mobility and access to wealth aggregation for those who are paycheck-dependent, under and un-employed marginalized, underserved, disenfranchised, commoditized and labor arbitraged. 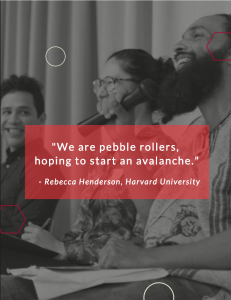 We believe that broadening and deepening societal inclusion to share in aspirational wealth directly produces accountable, aggregated high road impacts and tipping points starting with stronger, solidarity-infused and more resilient communities. Equal individual and collective access to equity harnesses proven civic and economic upswings of widespread ownership as a rising, healing tsunami-tide that comes equipped with its own “hope-floating” human flotillas. Since the 1970s, America has counterbalanced high per capita GDP with rising unequal income distribution. Results include stagnant wages, declining mobility, increased economic class divisions and racial tensions at levels not experienced since the Great Depression. Instead of “creative destruction” without any “creative reconstruction” for those tossed aside, 1worker1vote is constructing an urgent civil society cultural intervention at scale to bind high-impact union solidarity with the democratic power of cooperative ownership giving more working people, especially those in distressed and underserved communities, genuine control over their economic lives. 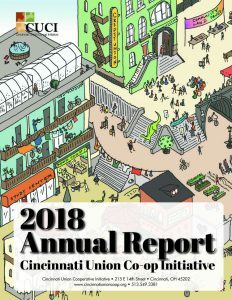 In early 2018 and in the spirit of “not the oyster, nor the pearl, but the grain of sand,” 1worker1vote collaborated with our Open Society Foundation (OSF) Economic Advancement Program and Soros Economic Development Fund interlocutors, and with LKS – Mondragon’s social transformation cooperative, MIT CO-LAB and the Cincinnati Union Cooperative Initiative (CUCI) to bring both a social impact funding mission and an Open Society Foundation delegation to Mondragon. Find a summary of the visit, in Spanish. Throughout 2018, 1worker1vote interfaced with global thought leaders and practitioners such as Mars Catalyst, Harvard Business School, Vienna’s Innovation in Politics Institute on “the digital future of work,” leadership partners from the global management consultancy, Oliver Wyman, for industrial conversions (introduced to us by Bob King, retired UAW International President, and with the active collaboration of fellow 1worker1vote advisory board member, Dr. Steve Sleigh, former IAM Pension Fund Director currently serving on Amalgamated Bank’s board), Mondragon, the American Sustainable Business Council (ASBC), and the UK’s Preston Cooperative Development Network. Last August and before our 1worker1vote institutional co-founder strategy retreat with CUCI and CEDC in the “independent republic of Point Lookout, NY,” ASBC’s pioneering work supporting the successful bipartisan passage of the “Main Street Employee Ownership Act” was publicly recognized by its political co-sponsors. In October, together with a New York City Deputy Mayor and a Bronx Cooperative Development Initiative delegation, LKS, Open Society Foundation, Preston/UK Model leaders and others, we participated in Bilbao’s Global Social Economy Forum (GSEF) 2018. The host city, Bilbao, unsurprisingly surpassed expectations having been voted the EU’s #1 sustainable city in 2017, within a distinct sociopolitical region showcasing lowest GINI Index levels comparable to Scandinavian countries, and a successful Universal Basic Income policy but accompanied by a competitive taxation regime similar to U.S. blue states. 1worker1vote also helped to engineer a collaboration between the National Cooperative Business Association and ASBC to co-sponsor and help develop NCBA’s annual “Coop Impact” conference, in early October, where we also introduced an official Bermuda delegation to the U.S. cooperative advocacy community. 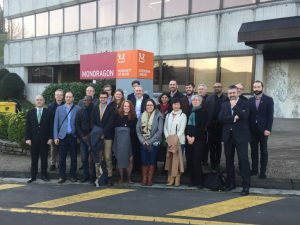 We teamed up with the Cooperatives for a Better World” non-profit and with Dr. Chris Clamp of Southern New Hampshire University to envisage a “Cooperatives for a Better World Global Online MBA”, in collaboration with Mondragon University. 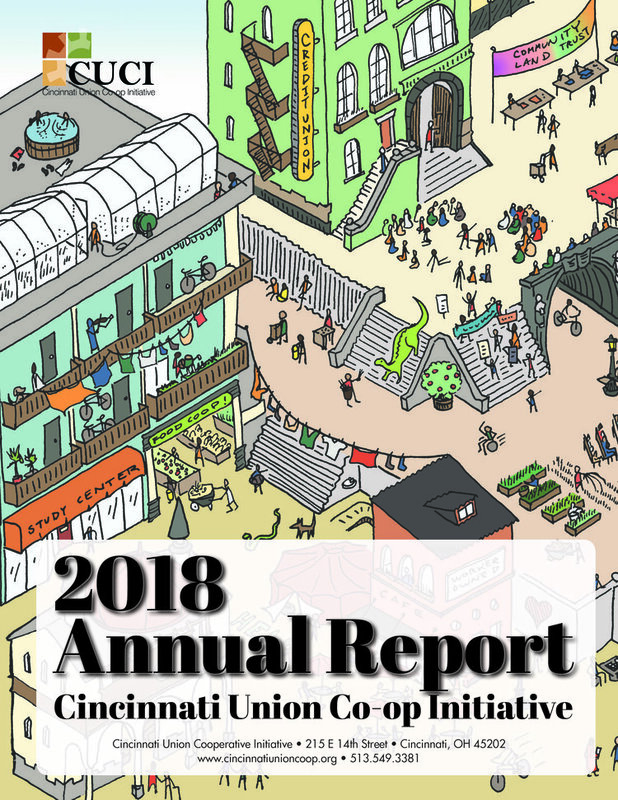 In November, 1worker1vote helped to sponsor and attend the Cincinnati Union Cooperative Initiative’s Annual “Creating an Economy that Works for All” Celebration. We were honored to co-host fact-finding missions to the Cincinnati Union Cooperative Initiative’s union co-op ecosystem by Pittsburgh City Council Member, Daniel Lavelle, who leads infrastructure development for that city, and by Bill & Beverly Parker, retired co-founders of Washington Cable Supply, Inc. (WCSI). Under the Parker’s leadership, WCSI grew to become the 7th largest African-American-owned company in the U.S. (ranked #7 on Black Enterprises BE 100’s list of largest minority USA-based corporations in 2000). CUCI is also leading the nationwide conversation on the 1worker1vote movement’s “coop of coops” structuring with communities from cities such as Dayton, Albuquerque, Los Angeles, Jackson, Nashville, New York City and Cincinnati. On November 20th, New York City Hall held its first public hearing on economic democracy acknowledging inspiration from 60 plus years of Mondragon cooperative ecosystem principles & practices. As evidence of the growing 1worker1vote-LKS-Preston-Cincinnati partnership, in late November, Dr. Julian Manley who chairs the Preston Cooperative Development Network, set the stage for well-attended Bermudian audiences by outlining the UK “Preston Model.” In early December, and also in partnership with the Bermuda Economic Development Corporation, five 1worker1vote cofounders and Ibon Zugasti of LKS completed the initial launch of a Bermuda cooperative ecosystem mission roadmap. Highlighting our Cincinnati ecosystem model based on Mondragon principles and practices, we developed good relationships with Bermuda’s Labor Unions and were able to come up with twelve potential union and worker cooperative start-ups and conversions that, if implemented successfully, could help to transform the island-nation economy and change traditional power paradigms. The 1worker1vote/LKS team participated in 34 meetings in 4.5 days including one print interview, two radio interviews, two town hall convenings and an in-depth departure interview with the highly articulate and supportive Bermuda Premier, David Burt, at Bermuda’s Parliament House. 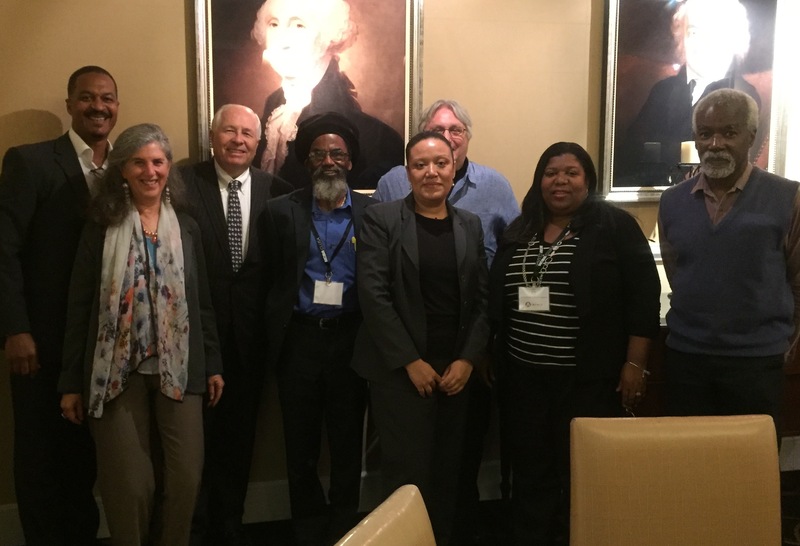 Relationship with USW Moves to U.K. In late December, 1worker1vote was instrumental in the signing of a Labor Peace Agreement with the United Steelworkers and the world’s leading, vertically-integrated medical cannabis company. Leo Gerard, USW International President, and Tom Conway, USW International Vice President, both 1worker1vote advisory board members, were instrumental in reaching out to the leadership of Unite, the UK’s second largest trade union with just over 1.2 million members to begin a transatlantic conversation on the union co-op model. 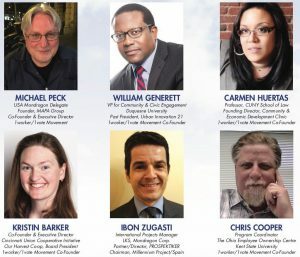 1worker1vote completed 2018 by joining with our Central Brooklyn “Save Interfaith Coalition” allies and CUNY Law School’s CEDC to co-found Citizens’ Share Brooklyn (CSB) with fellow board members Roger Green, Carmen Huertas, Jose Coello Sr., Bruce Richards, Maurice Reid Sr., and Dr. Toni Lewis. 1worker1vote also addressed the DC chapter of Democracy At Work headed by the indefatigable Cinar Atkins. Staring into the 2019 future, pebble rollers know that tomorrow’s policy angels coexist with today’s practice demons. Western democracies are learning the hard way that everything is downstream from culture. From Brexit to “America First” to “Gilets Jaunes,” structurally unequal western capitalist societies are reaping the whirlwind from generations of actively valuing and prioritizing capital over labor. Our galactically-uncommon, Planet “Hothouse” Earth, has revolted registering the five hottest years since 2014 with 2018 as the fourth warmest in recorded history. The deliberate suicidal folly of politically subverting climate science to stoke partisan cultural resentment may soon be judged by rising generations as genocidal crimes against both today’s and tomorrow’s humanity. But still hope surges. BlackRock is planning a money-market fund that will invest primarily in debt from environmentally conscious issuers according to Reuters (even though the Financial Times reported that “the United Nations-backed Green Climate Fund is struggling to regain credibility, raise money and find new leadership after a board meeting collapsed last summer”). This is where we’re going, capital as an instrument to advance humanity through proven and emerging hybrid ownership models such as union co-ops. A latest hybrid domestic innovation, the “Esop-erative” is being shared by the Ohio Employee Ownership Center (OEOC). Profits and Purposes. 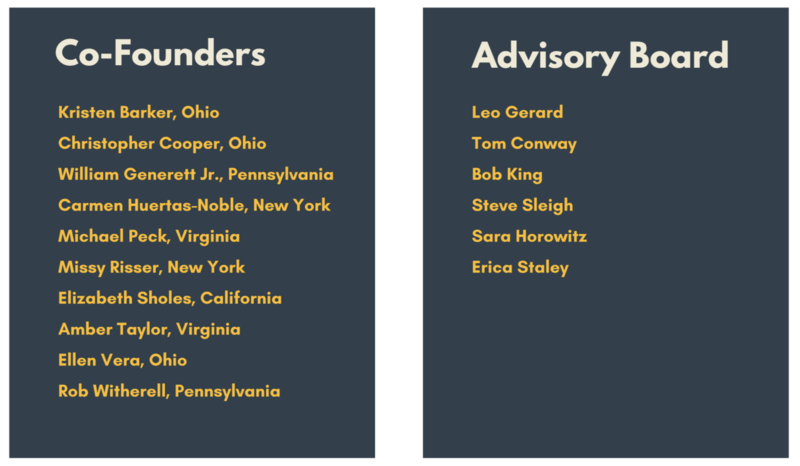 The American Sustainable Business Council unites 250,000 triple bottom-line (people, planet, profit) businesses and business member organizations. Mondragon’s distinguishing principles of “Sovereignty of Labor” and “Instrumental and Subordinate Nature of Capital” purposefully and “inextricably link” to Mr. Fink’s declaration, to the types of enterprises that ASBC convenes, and to the hybrid ownership enterprises that OEOC, CUCI, CEDC and the 1worker1vote movement are helping to structure. Mondragon-style co-ops are centered around labor, around the people doing the work. Created wealth is distributed in terms of the labor provided and there is a firm commitment to new family and community sustaining jobs. Only profitable enterprises provide the workplace freedom for Mondragon cooperatives to align principles with practice, to be able to afford adopted sustaining values. Generally, a corporation sells shares of ownership and management to raise capital, and then hires labor. The Mondragon Cooperatives do not sell shares to raise capital, instead, the workers own their cooperative enterprises, choose their management and rent sustaining capital. Within the Mondragon ecosystem, capital is labor’s instrument, not its master. The latest McKinsey Global Institute (MGI), “Globalization in transition: The future of trade and value chains” report deep-dives on “23 different industry value chains spanning 43 countries” and uncovers some “fundamental shifts” that fit right in line with societal transformation potential beyond borders. Three condensed trends merit mention: more local production & consumption; low-wages not the driver anymore; companies rethinking global footprints. First, the report notes that “emerging markets consume more of what they make and develop their own domestic supply chains.” This is a hallmark of “local, living economies” and a trend that can be accelerated by empowering stakeholders to become shareholders. Race to the bottom, “low-cost” labor is being replaced by “race to the top” high-skill labor. This is a competitive values equation. The Mondragon “Labor is sovereign” and “Capital, while instrumental is subordinate” principles may soon translate into a mainstream approach to localize higher quality, innovation and resiliency through workers empowered by a voice, a vote and equity. Seeding worker entrepreneurial ownership culture may prove the new, cross-border, conventional wisdom exceptional rule and not just a compilation of interesting regenerative economy exceptions relegated to separate geographies, cultures, and the accidents of fate. Third, while regional concentration increases through “traded services and cross-border data flows” that are becoming more important than capital goods, “some technologies, such as automation and AI, radically change the importance of capital versus labor and are causing companies to rethink their geographic footprints.” Clearly, as the recent, highly controversial, Amazon second USA headquarters nationwide search showed throughout 2018, winners pick other winners. Amazon’s “negotiated choices” landed on the east coast in Washington, D.C. and New York City. Global corporations co-locate with power centers (in this case political and financial) to dominate and impact. Such clusters become self-fulfilling tautologies with critical socioeconomic cultural upside and downside. The former manifests as recruiting magnets for the highest quality workforce with proven leadership chops in knowledge and applied know-how, civic and entrepreneurial culture, resiliency, productivity and innovation, and by placing a premium on those pre-positioned in the arena already chosen for its capacity to expand. The latter seeds monopolies, monopsonies, downward pressures on wages, dismal or zero innovation and fulfillment through social mobility for those at the proverbial bottom, commoditizes labor and recreates the “San Francisco” endless do-loop effect of half its population homelessly living on streets ringed by Silicon Valley privilege campuses. The virtuous cycle, transformational question before us is how best to structure broadened and deepened worker ownership as an uplifting “free markets” force of nature so that all workers are unbound in aspirational thought and deed to the best of their individual and collective intentions. Clearly, as 1worker1vote’s global management consultancy collaborator, Oliver Wyman, intuited back in May 2017 – there is a growing transatlantic and global groundswell for increasingly mainstream, metrics-based, inclusive and democratic hybrid model worker ownership models and enterprises, supporting public policies, and structuring regenerating ecosystems. The deal flow behind imagining, proposing, and financing this groundswell is triple bottom-line at its finest (people, planet, profit) and more resilient than traditional alternatives at a moment when resiliency is paramount for basic survival. Hybrid worker ownership models can repurpose humans back into the profit-centers of so-called “creative destruction” investment frames so that an uplifting construct exists for all. Incoming domestic social policy innovation includes but is not limited to: building local worker cooperative ecosystems from the ground up, universal basic income, guaranteed jobs, a “Green New Deal,” abolition of nationwide student loan debt totaling $1.4 trillion held by over 44 million people, Medicare for all, company-sponsored apprenticeships and work councils with worker membership on corporate boards, and reinvigorated anti-trust policies to offset digital economy recolonization. Before these happen, America will need to repurpose and decant its values and civic ethos to shed the sediments and shards of fear, hatred, greed, selfishness, cruelty, hypocrisy and racism that have kidnapped the country’s beating heart and spirit. Good things for all people can stick once contemporary power paradigms inspire, permit and sustain a truly “free marketplace” equating stakeholders to shareholders. Prioritizing economic democracy unchains the equalizing possibilities of unleashed hope when tightly combined on a structured bottom-up basis with top-down buy-in through mission-driven, profit-seeking enterprises. These triple bottom-liners synthesize innovation, train to a hope-inspired future, and commit to an indispensable individual and community “sweat equity” and “earned equity” commons where empowered worker-owners have a voice and vote to align their profits with their values. In February 2019, Senator Kristen Gillibrand became the first 2020 USA presidential candidate to feature worker and employee ownership as a prominent campaign plank (worker ownership mention at 0:38). Last September, the UK Labour Party’s Jeremy Corbyn and John McDonnell articulated a “Right to Own” policy framework with the “Preston model” as proof of concept. Those who reject but fear the Brexit and “America First” civic-culture mudslides intending to lump-dump anachronistic walls between the free movements of people have options. They are welcome to help us form a more uplifting and sustaining design and purpose-driven avalanche to construct the citizens’ share starting with local, regional and transoceanic cooperative ownership bridges.